GOOD SPORTSMANSHIP IS A REQUIREMENT. Managers/Coaches you are responsible for the conduct of every person associated with your team. If a you or a member of your organization, coach, player, parent or guest becomes dispectful to anyone (umpires included) or a distraction to the game, you will be given a warning and asked to address the situation with your organization, coach, player, parent or guest. If the distraction or disrespctfullness continues, the manager and the person causing the issue(s) will be removed from the game and complex. Once asked to leave if the person or persons, do not leave immediately the game will be stopped until the person or persons have left the complex. If the person or persons do not leave within 5 minutes of being asked to leave, the game will be forfieted by the team causing the distraction and Law Enforcement will be called. > Coolers are not allowed except for the team cooler. Please respect the rules of the individual parks by not bringing coolers, alcohol, and pets. Soft Toss against the fence is also NOT allowed. > NO SEEDS, GUM, OR METAL SPIKES on TURF FIELDS. > Please only one team cooler per team. Thank You!!!!! > During ALL games there will be TWO umpires. >"Fast Pitch Orlando" does allow dual roster players for different age divisions within the same tournament. Dual roster players can only pitch in one age division. Players are NOT allowed to play on 2 teams in the same age division. >8U will have a 5 run rule per inning including the last inning. > Rosters should be turned in prior to the first game at the head table or the roster should be maintained online prior to first game. This is the manager/coach responsibility to make sure the roster is updated prior to event or a hard copy turned in prior to first game. Pitching limits are at the Head Coaches discretion. "Fast Pitch Orlando" considers the safety and health of our players to be a high priority and we ask that coaches and parents be mindful of the number of pitches a player throws throughout the weekend. Any Pitcher is allowed back in the game unless they were removed due to limited visits. Pitchers are allowed 1 visit per inning, on the 2nd visit the Pitcher must be removed. Removing a pitcher does not count as a visit. (Per NHFS rules.) The coach is permitted to come to the mound for a conference with the pitcher three times during the game. If the pitcher is removed, the conference does not count against this limit of three. After the three conferences have been used, the coach can still come out for a fourth, but the pitcher must be removed from the mound. It is considered a conference as soon as the coach walks across one of the foul lines. During extra-inning games, one conference is permitted in each additional inning. These extra conferences cannot be saved and used in later innings. Turbo events will only allow 18 outs per player. One Hour 15 Minutes. No new inning after 1 hour 15 minutes. ALL COACHES SHOULD HAVE THEIR TEAMS READY TO PLAY 30 MINUTES PRIOR TO THE POSTED GAME TIME. ALL games will have TWO umpires. Umpire fees should be paid at the plate meeting before the game starts. Failure to pay umpire fee will result in a forfeit by the non-paying team. Games shall be declared complete games and ended upon fulfillment of any of the following mercy rule criteria. Mercy Rules do not apply when a run rule is in place. A. Once a tie is broken with three or more teams, teams advance to the next tie breaker rule until the tie is broken. *Note: This calculation is determined by taking total runs scored minus total runs allowed. The maximum run differential per game is +8 or –8. Our system auto defaults to an 8 run differential: example if you win 17 to 2 the score will reflect 10-2. C. When three or more teams are tied, highest run differential in all pool play games is used in determining all three places. If there is still a three-way tie, the fewest runs allowed is used to determine who advances. D. When a three-way tie is broken, and the remaining two teams are tied with run differential, the next tie breaker is actual runs allowed in all games. If the teams are still tied, a coin is flipped. Extra Hitters (EH) are allowed. Consequently, a team may choose to bat 10, 11, or more players by listing the additional players as EHs. Further, if a team chooses to bat their entire lineup, they may then utilize free defensive substitutions. In the event of a forfiet, the forfiet will be recorded at an 8-0 score. 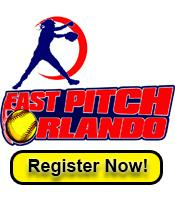 Fast Pitch Orlando allows a EH in all age divisions. Teams may utilize courtesy runners for the catcher or pitcher. Courtesy runners must first come from the pool of eligible substitutes in the dugout. If a team has no eligible substitutes, the player who was the last recorded out shall become the courtesy runner. It is not necessary for the same substitute player to courtesy run for the pitcher or catcher each time a courtesy runner is utilized; however, if a courtesy runner is used for the pitcher or catcher more than once in the same inning, the same runner must be re-used. During pool play the home team will be decided by coin flip. Dugouts are on a first come, first serve basis. During Elimination Games the higher seed has the election of being home team until the championship game. Championship game: where the home team will be decided by coin flip. Metal cleats are NOT allowed for the 8u-12u divisions. Molded Cleats or Turf shoes must be worn by all divisions, including 13u-18u when playing on turf fields at select complexes. The question comes what to do if you have an illegal pitch and a runner leaving base early on the same play. Since the illegal pitch is a delayed dead ball, play continues. However the runner leaving early is a dead ball. This ends the play and both penalties should be enforced. The runner who left base early is out. The batter is awarded a ball for the illegal pitch. No runners advance because of an illegal pitch. In 8u and 9u, illegal pitchs will not be called. The penality for an Illegal pitch is one ball awarded to the batter. No runners advance unless the illegal pitch occurs with the bases loaded and this constitutes ball four. The 8u through 18u age groups shall be limited by the High School Softball Rules published by the National Federation of State High Schools (NFHS) regarding bat specifications. In order to comply with NFHS (ASA) Rules all bats must have either the 2000 or 2004 ASA Approval Stamp on them. If the bat does not bear one of the ASA Stamps the bat is deemed to be illegal. According to NFHS rule 7.4.2. "If the batter enters the batter's box with an illegal bat or is discovered having used and illegal bat and the infraction is detected before the next legal or illegal pitch, the ball is dead immediately. All runners must return to the base occupied at the time of the pitch. When the illegal bat is an altered or non-approved bat, the batter and head coach are also EJECTED. Runners would not return if they were put out on the play." THE ONLY EXCEPTION TO THIS LIST IS THE GHOST GOLD BATS. BOTH THE GOLD AND BLUE GHOST BATS WILL BE ALLOWED IN FAST PITCH ORLANDO. A player or coach who is bleeding or who has an open wound shall be prohibited from participating further in the game until appropriate treatment has been administered. If medical care or treatment can be administered in a reasonable amount of time, the individual would not have to leave the game. The length of time that is considered reasonable is according to the umpire’s judgment. The reentry rule would not apply to players in case of a bleeding injury. If there is an excessive amount of blood on the uniform, it must be changed before that individual may participate. The bottom half of the last inning will not be completed solely for tie-breaker purposes. Once the home team has more runs than the visiting team in that inning the game will end. 1. If team finishes 2 full games, no refunds/credits shall be issued. 2. If team finishes 1 full game, team shall be issued a credit to the next Fast Pitch Orlando event they choose to attend. They must provide the email that was sent showing credit. 3. If event is completely rained out, tournament fee shall be refunded. If a game is suspended prior to being official and there is not enough time to resume – the game would be considered complete at the end of the last complete inning. If tied at the end of the last complete inning – the game would stand as a tie. A) If one inning hasn’t been completed and the game is suspended and there is not enough time to resume - the higher seed would advance to the next round. D) If the championship game starts and is not able to complete due to weather/darkness and there is no time to resume – the game would be considered official at the end of the last complete inning. E) If tied at the end of the last complete inning – both teams will be named co-champions. The age of the player on December 31st of the PREVIOUS year determines division age. Ex. The player is 10 on December 31, she can play 10U all year. IF the player is 11 on December 31st, she must play 12U all year. Players are allowed to move UP in age divisions but never allowed to play down. Sec 2. The softball field shall contain a 60-foot square infield diamond and an outfield area that may or may not be enclosed by a fence. All lines on the playing field shall be marked with a material, which is not injurious to the eyes or skin. Lime or caustic material of any kind is prohibited. The catcher’s box, bases, coach’s boxes, batters boxes and 3 foot first base line shall be as in the “The Field Diagram”. The infield and outfield, including the boundary marks from the apex of home plate to 1st and 3rd, and their extended foul lines, are fair ground. All other areas are foul grounds. The recommended width of all marked (chalked) lines on the playing field is 2 1/2 inch. A. Home Plate shall be a 5 sided slab of whitened rubber or other suitable similar material. The sides shall be 8 ½ inches long, the edge facing the pitcher shall be 17 inches wide and parallel to the pitcher’s plate. The sides facing the catcher shall be 12 inches long and on the foul lines. B. First, Second, Third Base shall be 15 inches square, made of canvas or other suitable material and not more than 5 inches high. Each base shall be securely attached to the ground. D. The Pitching Plate shall be a rectangular slab of whitened rubber or suitable material, 24 inches by 6 inches. It shall be set in the ground with the top flush with the playing surface. E. The batter’s box shall be 7 feet long. The front of the batter’s box shall be 4 feet forward from the center of home plate and 3 feet wide starting 6 inches from the plate. F. Catcher’s Box shall be 10 feet in length from the rear outside corners of the batter’s box and 8 feet, 5 inches wide..
G. Three foot running lane is a line drawn 3 feet from and parallel to the first base foul line starting halfway between home and first base and extending to first base. H. Pitcher’s Circle shall be a circle which is 16 feet in diameter (8-ft. radius) drawn from the mid-point of the front edge of the pitcher’s plate. I. Coaches’Boxes shall be 8 feet from the foul lines. 15 feet long from the back edge of the first and third base extending toward home plate and 3 feet wide. J. On deck circles shall be circular, 2 ½ foot radius, a safe distance to the side and away from home plate; at least 30 feet if space allows. Neither team’s players shall warm up in the other teams on deck circle. The on deck circle does not have to be occupied, but if a player wishes to warm up, they shall do so in their team’s on deck circle. BATTING HELMET In the Youth program, NOCSAE approved batting helmets with extended ear flaps, which cover both ears and temples are mandatory for all batters, on deck batters, base runners, non-adult base coach, non-adult bat & ball shaggers in live ball territory, even if the ball is dead. Batting helmets must have NOCSAE approved attached face mask/guard. A commercially manufactured face mask/guard may be attached to a batting helmet, provided it is attached by the manufacture; or a face mask/guard may be attached to a helmet that does not have a face mask, provided the attachment procedure is approved by the manufacture. The official ball to be used shall have raised seams and shall be of spherical design with a smooth surface. All 10 year old and younger divisions shall use the 11-inch softball. All other programs shall use the 12-inch softball. Shoes are required equipment for all participants. All players must wear shoes with plastic, nylon, canvas, leather or similar synthetic material uppers. Spikes must not extend in excess of 3/4 -inch from the sole and may not be round. A. (Youth 12U and younger) The sole may be smooth, have soft or hard rubber cleats. Shoe sole or heel protectors other than the standard shoe plate are prohibited. In all divisions 12 and Under and younger, Metal cleats and metal toe plates are prohibited. PENALTY: In divisions which do not allow metal cleats and toe plates, a player who participates with metal cleats or toe plates where prohibited is subject to penalties. Metal cleats and toe plates must be removed prior to continuing play. B. (Adult or14U and older ) The sole may be smooth, have soft or hard rubber cleats or rectangular metal cleats. Shoes with detachable cleats that screw into the sole of the shoe are allowed. Pitching toes are allowed for all players as long as the pitching toes are securely fastened. Players in the game are prohibited from wearing jewelry such as rings, watches, earrings whether covered with tape or not, bracelets, necklaces (including cloth and string type), or other hard decorative items. Unadorned devices with no sharp edges or points, such as bobby pins, barrettes and hair clips, no longer than 2 inches, may be worn to control a player’s hair are permitted. Medical alert bracelets or necklaces are not considered jewelry. If worn it must be taped to the body, so as to remain visible. If jewelry is not removed, that player will not be able to play until the jewelry is removed. Coaches Wristbands (Play Indicator) are Legal. The date for the youth age eligibility is December 31st of the PREVIOUS sanctioned season. The players age on December 31st of the PREVIOUS SANCTIONING SEASON will be the age group the player is eligible for during the ENTIRE sanction year. All players must meet the age requirements to be put on a current year’s roster. All games shall have a 75 minute limit. Games can end in a tie during pool play. Bracket games that are tied at the end of regulation or upon completion of an inning with time expired shall go to the Tie-Breaker method. ALL COACHES SHOULD HAVE THEIR TEAMS READY TO PLAY 30 MINUTES PRIOR TO THE POSTED GAME TIME. Each team will be allowed 1 team cooler, brought in by a coach that may contain bottled water, ice packs, wrap, etc. Please do not bring other drinks or food to the facilities. 8.07.A Fair Ball Arc: There shall be a twenty (20) foot arc drawn from first (1st) baseline to third (3rd) baseline in front of home plate. A batted ball must go past this line to be a fair ball. 8.07.B Safety Arc: There shall be a thirty (30) foot arc drawn from first (1st) baseline to third (3rd) baseline in front of home plate. Infielders must stay behind this line until the ball is hit. 8.07.C Pitching Circle: There shall be a ten (10) foot diameter circle with the front edge set at forty-two (42) feet from the rear point of home plate. 8.07.D Pitching Machine: The front leg(s) shall be set at a distance of forty-two (42) feet from the rear point of home plate. 8.07.E.2 39 M.P.H. – 42 M.P.H. for the 8U age division. 8.07.E.3 When using the Blue Flame manual machine, it should remain at a setting of 9 at all times. 8.07.F Ten (10) defensive players shall play in the field with four (4) outfielders. The fourth (4th) outfielder shall not assume an infield position. All outfielders shall stay behind the baselines. 8.07.G The defensive player listed as pitcher shall not leave the pitching circle until the ball is hit. Rule 8.07.G Penalty: The play continues. After the play has ended, the offensive team has the option of taking the result of the play or no-pitch. Rule 8.07.G Additional Penalty: First Offense: Warning; Second Offense: Removal of player from the pitching position for the remainder of the game. 8.07.H Defensive coaches shall not be allowed on the field of play and shall coach from the dugout. 8.07.I The Infield Fly Rule shall not be in effect at any time. 8.07.J The batting order shall constitute all present players on the team roster at the beginning of the game. Late arrivals shall be inserted at the bottom of the batting order. All players on the roster shall bat before returning to the top of the batting order. 8.07.J.1 Teams may start a game with eight (8) players. The ninth (9th) position in the batting order will be declared an out each turn at bat. There is no penalty for not having a 10th player. be added to the bottom of the batting line-up as soon as they become available. 8.07.K Teams may use free substitution on defense but the batting order shall remain the same. 8.07.L Teams may bunt a maximum of two (2) times per inning. 8.07.L.1 Fake bunts shall be prohibited. A batter that “shows” bunt is committed to an attempt to bunt or take the pitch. 8.07.M The batter shall receive a maximum of five (5) pitches or three (3) swinging strikes. Rule 8.07.M Comment: A batter that has received less than five (5) pitches and has a count of two (2) swinging strikes shall have her turn at bat extended on foul balls. 8.07.N A player may only be Intentionally Walked once per game by announcement from the defensive team. 8.07.O Runners shall not lead-off or steal bases. A runner is out for leaving the base before the ball is hit or reaches homeplate. 8.07.P A courtesy runner for catcher of record only the previous inning may be used. The courtesy runner shall be the player that made the previous out. If no outs have been recorded in the game, the courtesy runner shall be the previous batter not on base. 8.07.Q A team may score a maximum of Four (4) runs per inning, including the last inning or record three (3) outs. 8.07.R Umpires shall call “Time” after every play and declare the ball dead. “Time” shall be called as soon as the lead runner is not attempting to advance. “Time” does not have to be called by the defense for the purpose of this rule. Rule 8.07.R Comment: When a runner stands off a base and “jukes” or “feints” back and forth, this is to be interpreted as “not attempting to advance” and “Time” shall be called. 8.07.S When a batted ball hits the pitching machine, the ball is dead, the batter is awarded first (1st) base and all runners shall advance one (1) base. Time limit is 1 hour 15 minutes. Except championship game will be 1 hour 30 minutes, still using 5 runs per inning. Games will play to time. Run rules do NOT apply. The game will be played to time limit. No leadoffs. NO STEALING. The runner may begin to run when the ball crosses the plate. Pass Balls - This is ONLY from first to second or second to third. No stealing home -- a runner, starting a play at 3rd Base may only advance home on a batted ball or when forced home by a walk, hit batter, or other force play (bases loaded). If the pitcher walks TWO batters in the same inning, the Coach pitch rule comes into play. After TWO walks in the same inning, any time the pitcher walks a batter the batter will remain at bat with the number of strikes throw by the pitcher. When the Coach enters the game he/she will resume the count on the batter. The coach will pitch until the batter hits the ball into fair territory or strikes out. Once this at bat is complete, the player/pitcher will return as pitcher. (When the coach is pitching, the player/pitcher MUST have one foot within the pitching circle). STOPPING RUNNERS: This can be done two different ways. First, any defensive player can be in front of the lead runner. Once this happens the Umpire will call time and the play is dead. Second, the PITCHER must be in the pitching circle, with the ball, raise her hands and yell "TIME". At this point the play is dead. Once the play is stopped by the Umpire, the half way line is used to determine if the runners must go back to the previous base touched or proceed to the next base. (Half-way Line - a real or imaginary line 30ft from each base. At the time the play is deemed dead by the Umpire, if the runner is past the Half-Way line they will be given the next base. If the runner is behind the Half-Way line, they must return to the previous base). Walk By Player (Pitching). When ball 4 is thrown it is a dead ball situation and the runner may only advance to first base. When forced additional runners may advance to the next base. A runner starting from 1st or 2nd Base may advance home as a batted ball continuation of a play (there is NOT a mandatory ""red light"" at 3rd Base for a play in motion). 8U is closed bases meaning a batter may not run on dropped 3rd strike, the batter will be automatically out on a dropped 3rd strike. Bunting is allowed. But no Slash bunting, meaning a batter cannot square to bunt then pull back and swing. 5 runs an inning no matter what inning or game. This holds true for Saturday and Sunday games. No leadoffs. NO STEALING. The runner may begin to run when the ball leaves the pitcher's hand. Pass Balls - There are NO pass balls and a runner cannot advance on a pitched ball the catcher misses. No stealing home -- a runner, starting a play at 3rd Base may only advance home on a batted ball. During Coach pitch the coach will pitch FIVE pitches or THREE strikes, which ever occurs first, to the batter. No matter the strike count, the batter must hit or foul off the fifth pitch to avoid being out. There are NO walks by the Coach or pass balls. The Coach will make every effort as to not obstruct any play. IF the Umpire feels the Coach did obstruct the play, the batter will be called out and ALL runners will return to their base prior to the obstruction. IF the Coach is hit with a batted ball, the play is dead and all runners and batter are given one base. THERE WILL BE NO COACHING FROM THE COACH PITCHING. If this occurs, the first occurance a strike will be added to the batter. The second and all subsequent occurances, the batter will be called out. Delay of Game Rule. If it is deemed by the umpire the Coach pitching is intentionally delaying the game by throwing poor pitches or telling the batter not to swing, the Coach will be removed by the Umpire and time added to the game. This rule is at the sole discretion of the umpire. Coaches have 20 seconds to pitch the ball from the time they receive the ball from the catcher or umpire. Bunting is NOT allowed. NO Slash bunting is allowed, meaning a batter cannot square to bunt then pull back and swing.